When the summer hits, no one wants to sit at home and swelter as the temperature climbs to the 90s and above. In 1902, the first modern air conditioner was created in Buffalo, New York by Willis Carrier. Since that fateful inception, the air conditioner has become an almost required appliance for a home during the summer months. With such a high degree of proliferation throughout the country, there’s bound to be a myriad of models to choose from, but what if you don’t have a dedicated AC sleeve, or only want to cool a single room? This is where window air conditioners come in. While they are typically used to cool a smaller area, these ACs can greatly help cool your living space. In this write-up, we’ve cherry-picked some of the best AC models on the market today, and even found a great budget model to help keep you cool during this and future summers. Our Gold Pick window air conditioner is produced by the reigning champion of refrigeration, Frigidaire. The appliance giant began as a small company in 1918 that was created to sell the world’s first self-contained electric refrigerator, which was invented by the company’s founders. Over the next century, Frigidaire would come to be known for a bevy of appliances, such as microwaves, home food freezers, and of course, air conditioners. As our Gold Pick, this AC unit is well-regarded by both consumers and critics, and is widely considered one of the best on the market today. Simply put, this is a very feature rich air conditioner. Beginning with the included remote, there are a lot of cool settings on this air conditioner that make life easier and more comfortable. The first feature on the remote that almost trumps all others is what Frigidaire calls “remote sensing”. The remote has its own temperature sensors, and uses this remote sensing to detect the temperature where you are sitting. The remote then wirelessly sends this temperature information back to the main AC unit where it will use the temperature presets that you’ve established to either raise or lower the ambient temperature in the room. This is a perfect feature for when you are relatively far away from the unit and you’d like to either warm or cool the area in your direct vicinity. Outside of this impressive feature, this AC’s remote also boasts some intuitive design. From the remote, it’s easy to adjust the fan speed, increase the temperature setting, or set the timer for the AC to deactivate when not in use. There is also a sleep setting on the remote that you can use before you go to bed. Once the timer begins, the air conditioner will intermittently raise the temperature. It will only go up a few degrees, but this reduction of the functioning of the compressor will increase the appliance’s efficiency when you are asleep. This is also a great air conditioner if you have seasonal allergies. Since the time when you take out the air conditioner can often coincide with the start of the allergy season, Frigidaire integrated an extra allergy sufferer-friendly feature into the design of this AC unit: an ionizer. What an ionizer does is pull pollen, dander, and impurities from the air, making it easier for allergy sufferers to breathe. Also with air quality in mind, this appliance also has a built in humidifier that will draw three pints of water out of the air per hour; a great feature that will also ensure the removal of allergens from the immediate environment. On top of all these features, this air conditioner is one of the quietest on our list. Also, unlike other window units that push water outside through a dripping process, this unit actually redirects the cool water it collects onto the heated compressor. This feature cools the compressor and helps you save on your electric bill in the process. It also has a great cooling functionality; the AC can cool an area of 450 sq. feet in a few minutes. The concept of the Smart Home has been gaining steam ever since the first one was developed in the late 1970s. Today, there is a notable attempt to integrate the majority of home electronics and systems into one control scheme that is accessible from the convenience of a Smartphone. Google’s Nest line of Smart thermostats was a heavily covered device a few years back, and since its inception, many other manufacturers have been attempting to add a bit of intelligence to managing your home’s temperatures. GE and the Smart Home company Quirky have recently tossed their hats into the arena of temperature management in a connected home with our Silver Pick, the Aros Smart Air Conditioner. Aros was conceptualized by IT worker, Garthen Leslie who once looked up in his neighborhood and saw all of the AC units hanging out windows. Garthen then imagined an air conditioner that could actively help its owners manage their utility bills by helping manage smart output profiles. Garthen pitched his idea to Quirky, a community that creates smart products, and the rest is history. This is one of the more attractive units on our list of window air conditioners. This Quirky product has a completely flat face that is comprised of a metal grill that houses several capacitive touch buttons. Internally, this device isn’t that much different than your standard AC, but its physical design and connected functionality make it anything but standard. One really great aesthetic feature of this appliance is the way it handles the digital display that provides temperature information. This digital display actually shows up underneath the face of the unit, with a white background and startling blue digits. The first thing about the setup of the Aros is that it connects to your home network via Wi-Fi. You can start the process by the touch capacitive buttons on the face of the unit. Once connected, you can simply touch your Smartphone to the home icon in the middle of the appliance’s face. Since Aros uses NFC tech, you should be connected almost instantly. Once connected, you can use the Wink app to control all of the functionality of Aros. You’re probably thinking, “Well it connects, but what makes it Smart?” Well, this Smart device starts thinking the instant you turn it on for the first time. Since you are connected via the home network and your Smartphone, Aros will turn off once it senses you’ve left your home. This will save you money on your electric bill and will make for one less thing to think about as you leave to go to work. Also, if you’re on your way back in, the Wink app will allow you to control your AC unit from anywhere that you’ve got internet connectivity. As you use the device, it will start to track your energy and cooling habits. Once tabulated, Aros will generate reports and suggestions on how you can cut your cooling bill in the future. 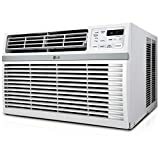 On Amazon, 51 percent of the reviewing audience has granted this smart air conditioner a positive rating, and while this may seem low, the majority of complaints are centered around the loudness of the unit, which seems to be at, or around the same decibel level as a standard AC unit. Positive reviews seem to point to the unit’s convenience and its ability to shave money off of the electric bill by helping you manage its power profile smartly. Our Bronze Pick is developed by South Korean electronics giant, LG. LG started as a chemical company in Seoul in 1947. Eventually the company that eventually became Lucky-Goldstar after the merging of two of its smaller companies went through a final name change in 1995 and became the LG brand that we know today. Today, LG produces everything from televisions to toothpaste (in its native South Korea), and is recognizable as one of the electronics industry’s well-established leaders. Our Bronze Pick, as one of the appliance products produced by the company, is a great window-mounted solution for someone looking to cool a relatively large space quickly. The remote for this air conditioner has some great features. Firstly, from an aesthetic point of view, the remote is ergonomic and will fit anywhere. The control scheme is intuitive and easy to manipulate; the two triangular buttons on top control the temperature that you want the room to stay set to. The button directly underneath that will help you set the fan speed to whichever setting you’d like it to be at. Fortunately, the fan actually has three distinct speeds, so that you have some great cooling options. The final two buttons are for the timer and mode selection. The timer functions will allow you to set the behaviors for the entirety of a 24 hour period. This means, you can have the air conditioner cycled off from eight to six, while you are at work, on extra cool, while you are at home, and use an energy-saving profile while you sleep. The mode selection option on the remote will help you manage the three fan modes and the three cooling modes. In addition to these mode adjustments, LG incorporated a feature into this device that we also have on our Gold Pick: a dehumidifier. This feature makes this the perfect air conditioner for a damp area or room. The on-board dehumidifier draws moisture out of the air at a rate of four pints per hour. The collected water then drains out of the outside of the air conditioner. Having this feature will help prevent mold and mildew from forming, as these two spore-based annoyances require a high amount of air moisture to grow. When it comes to efficiency, this is one of the most efficient devices we have on our list. It is currently listed at a 10.8 Energy Efficiency Ratio (EER) by the Energy Star rating system which will save you money from month-to-month, and also help to reduce your carbon footprint. With this thinking in mind, LG also opted to utilize the environmentally safe R410A refrigerant, this substance is much more eco friendly than the refrigerants of yesteryear. Let’s face it; cooling your room can get pretty expensive. Some of these devices cost upward of $400 dollars and might even cost you more to install, so saving a couple of bucks would probably be something you’d want; especially if you are ballin’ on a budget. This is where our ballin’ pick RCA window air conditioner comes in. It has a quality construction, easy to use controls, and will really cool the area you put it in; as a matter of fact, this 5,000 BTU blower will effectively cool an area of 150 square feet. The design of this unit is classic. It has a vent on the front that houses the filter, and two output blowers on the top. With these blowers you can achieve an airflow that can be projected a full 360 degrees using articulation. 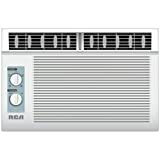 While many of the previous models use digital controls, RCA has opted to use physical controls for this AC unit. This is actually a plus, as physical dials can be operated very easily and with mostly tactile input. From these mechanical controls, you’ll have access to three fan speed options and three cooling options. This unit also keeps the environment in mind and uses the R410A refrigerant to reduce the environmental impact of these devices. It’s very important to remember that air conditioners are very heavy objects that can do a lot of damage to people or property if they aren’t secured appropriately. As a matter of fact, many municipalities require window AC owners to have a bracket installed that will safely balance a window air conditioner into your window’s housing. Even areas that don’t have a specific regulation, such as New York City, will heavily fine air conditioner owners who don’t have their ACs secured adequately. These brackets are installed onto the side of your home and at the bottom of your AC unit. Having these installed by a professional can set you back more than a hundred dollars, so be sure that you take this into account when purchasing the best window air conditioner. Also, many of these types of ACs don’t come with a bracket, so you may have to do some searching to find the appropriate support for your new appliance. The British Thermal Unit (BTU) measurement we find on the majority of air conditioners indicates the amount of work your AC will have to do to raise the temperature of one pound of water by one degree Fahrenheit. So as you might have guessed from your exposure to other air conditioners, as a general rule, the more BTUs a unit has, the better it will work at cooling the area around it. While a lot of BTUs is great, you can quickly wear out your compressor by having a machine too quickly cool the room, cycle down, and then start back up as the room starts to warm. By now, we’re sure you’ve heard about Energy Star ratings, and how they affect the environment and your electric bill. Maintaining efficiency is absolutely integral to the reduction of our carbon footprint, so when looking into a new air conditioning unit, you should try to be 100 percent sure that it’s Energy Star rated for efficient performance. If you are not buying an Energy Star rated appliance, you can still purchase an energy efficient model. Most models of air conditioner will have an Energy Guide rating; this will tell you how much you can expect to pay in energy cost in an average year. Not only does this figure give you an idea of how much you’ll be spending on a yearly basis, but devices with lower costs tend to expend less power; indicating a more ecologically sound device. Window mounted air conditioners can have a standard chassis that loads right into your window or a slide-out chassis. For the slide-out chassis style, there is a bracket that holds the air conditioner in place by surrounding it. When you need to clean the AC, you can simply remove the entire device from the chassis, while it will stay in the window. This adds a bit of convenience to the cleaning process, and it will also make it a cinch to remove the window unit when the weather no longer suits it. This degree of convenience is useful for many, so when you are seeking out a new window air conditioning unit, be sure to consider if a slide-out chassis model will fit your home. Did you know that it’s best to install one of these types of air conditioners in a place that is mostly in the shade? This will help the air conditioner operate most efficiently. As a general rule, utilizing a north-most window will cool your house or room the easiest. Also, be sure that you have the appropriate outlet when you are installing your air conditioner. Larger air conditioners need different plug types, so when you are seeking out a new appliance for your house, be sure that you have the right outlet type for the device you are looking into. Also, make sure you select a location that will most benefit from the airflow; picking a location that is cut off from the rest of the house because it’s the most in the shade won’t be doing your home’s temperature any favors. Timers – This will enable your air conditioner to turn off or turn on at preset points in the day. Want your device to turn off while you are at work? That’s programmable. Want it to turn on a half an hour before you return so that your home is nice and frosty when you step through the door? There are models that can do this easily. Remote Control Compatibility – This is super convenient. Many modern air conditioning units include remote functionality. This will let you adjust the room’s temperature from the comfort of your own couch. Taking this convenience even further, some brands of AC actually include remotes that sport LCD screens that give you a dashboard to control your air conditioner with. Smart Functionality – As the wealth of capabilities of the Smart Home increase, it was only a matter of time before someone manufactured the Smart AC. The Quirky model we have as out Silver Pick is one such device and there is more coming from different manufacturers. Smart Functionality will allow you to control all of your air conditioner’s various functions from the convenience of your Smartphone. Typically, you’ll need a Smart Hub to gain full control, but it’s nice to have so much control while using only one device. Dehumidification – Air conditioners that have built in dehumidifiers can be a real boon if you are trying to reduce the ambient moisture of your living space. These types of ACs will reduce the water in the air by several percent and safely evaporate or condensate the excess moisture away. Included Ionizer – Do you have incessant allergies? Then, it might be a good idea to look into a air conditioner that has an ionizer. This type of device will scrub allergens like pollen and pet dander from the air, making allergy sufferers rejoice. Keeping cool in the summer is made incredibly easy with all of the air conditioning options available on the market today. With more robust features appearing on many new AC units, including smart home functionality and pre-programmability, it’s hard to make a decision on a new unit to keep your family cooler. Hopefully, our write up has given you a degree of edification about your options for modern window-mounted air conditioning units. Take a look at the models we’ve reviewed, consider everything we’ve outlined in the pre-purchase section, and you’ll be on your way to utter coolness.